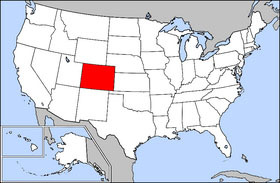 Colorado is a state in the western United States. The name of Colorado came from the Spanish word "colorado" which means "reddish color". The name comes from the Colorado River. It is famous for the Rocky Mountains, where the highest peaks of the range exist. The state capital and largest city is Denver. As of the 2000 census, Colorado's population is 4,301,261. The U.S. Post Office abbreviation for the state is CO.
USS Colorado was named in honor of this state. The Colorado Gold Rush of 1859 brought large numbers of settlers to the Denver area. Gold in paying quantities was soon discovered in the Central City area. By 1860 the population of Central City was 60,000. Like all resource extraction, mining is a boom or bust situation and over the years many small towns were established then abandoned when the paying ore ran out or the market collapsed. Some like Aspen, Telluride, and Cripple Creek have found new life as ski resorts, cultural centers, or gambling towns; others never recovered and became ghost towns. Colorado Territory was organized as a United States territory on February 28, 1861. Colorado women were granted the right to vote starting on November 7, 1893. 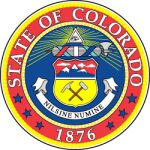 Like the majority of the states, Colorado's current constitution provides for 3 branches of government: the legislative, executive and judicial branches. The legislative body is the General Assembly made up of two houses, the House of Representatives and the Senate. The House of Representatives has 65 members and the Senate has 35. The governor, currently Bill Owens (Republican), heads the executive branch. East of the Front Range of the Rocky Mountains are the Colorado Eastern Plains, the section of the Great Plains within Colorado at elevations ranging from 3500 to 7000 ft (1,000 to 2,000 m). Kansas and Nebraska border Colorado to the east. The plains are sparsely settled with most settlements along the South Platte and the Arkansas rivers and the I-70 corridor. Rainfall is meager, averaging about 15 in/year (380 mm/year). There is some irrigated farming, but much of the land is used for dryland farming or ranching. Winter wheat is a typical crop and most small towns in the region boast both a water tower and a grain elevator. The major cities and towns lie just east of the Front Range, in the I-25 corridor. The majority of the population of Colorado lives in this densely urbanized strip. Snowpack accumulation at 14,255 ft. on Longs Peak in Rocky Mountain National Park. To the west lies the Front Range of the Rocky Mountains with notable peaks such as Long's Peak, Mount Evans, Pike's Peak, and the Spanish Peaks near Walsenburg in the south. This area drains to the east, is forested, and is partially urbanized. With urbanization, utilization of the forest for timbering and grazing was retarded which resulted in accumulation of fuel. During the drought of 2002 devastating forest fires swept this area. To the west of the Front Range lies the continental divide. To the west of the continental divide is the Western Slope. Water west of the continental divide drains into the Pacific Ocean via the Colorado River. Within the interior of the Rocky Mountains there are several large parks or broad high basins. In the north, on the east side of the continental divide is North Park. North Park is drained by the North Platte River which flows north into Wyoming. Just south, but on the west side of the continental divide is Middle Park, drained by the Colorado River. South Park is the headwaters of the South Platte River. To the South lies the San Luis Valley the headwaters of the Rio Grande which drains into New Mexico. Across the Sangre de Christo Range to the east of the San Luis Valley lies the Wet Mountain Valley. These basins, particularly the San Luis Valley, lie along the Rio Grande Rift, a major geological formation, and its branches. The Rocky Mountains within Colorado contain 52 peaks over 14,000 ft (4,270 m), known as fourteeners. The mountains are timbered with conifers and aspen to the tree-line, at an elevation of about 12,000 ft (4,000 m) in southern Colorado to about 10,500 ft (3,200 m) in northern Colorado; above this only alpine vegetation grows. The Rockies are snow-covered only in the winter; most snow melts by mid August with the exception of a few small glaciers. The Colorado Mineral Belt stretching from the San Juan Mountains in the southwest to Boulder and Central City on the front range contains the historic gold and silver mining districts of Colorado. The Western Slope is generally drained by the Colorado River and its tributaries. Notable to the South are the San Juan Mountains an extremely rugged mountain range and to the west of the San Juans, The Colorado Plateau a high desert bordering Southern Utah. Grand Junction is the largest city on the Western Slope. Grand Junction is served by Interstate Hiway I-70. To the southeast of Grand Junction is Grand Mesa, a large flat-topped mountain. Further east lie popular ski areas like Aspen, Crested Butte, and Steamboat Springs. The northwestern corner of Colorado bordering Northern Utah and Western Wyoming is mostly sparsely populated rangeland. From west to east, the state consists of desert-like basins, turning into plateaus, then alpine mountains, and then grasslands. Mount Elbert is the highest peak in the Rocky Mountains within the continental United States. The famous Pike's Peak is just west of Colorado Springs. Its lone peak is visible from near the Kansas border on clear days. The state's economy broadened when irrigated agriculture developed, and by the late 19th century livestock raising had become important. Early industry was based on the processing of minerals and agricultural products. Current agricultural products are cattle, wheat, dairy products, corn, and hay. In the second half of the 20th century the industrial and service sectors have expanded greatly. The state's economy is diversified and is notable for its concentration of scientific research and high-technology industries. Other industries include food processing, transportation equipment, machinery, chemical products, minerals such as gold and tourism. Denver is an important financial center. The total state product in 1999 was $153 billion putting Colorado the 21st. Per capital personal income in 2000 was $32,949. In combination with one or more of the other races listed. The six numbers may add to more than the total population and the six percentages may add to more than 100 percent because individuals may report more than one race. Each city named in bold has a population greater than 100,000. Unlike most high school athletic letter clubs, the varsity athletes of some of the high schools are awarded a "C" for Colorado, and they belong to the "C Club" of their high school, when they letter in a sport, rather than the initial of the school. This is not the case at most high schools. At Thompson Valley High School in Loveland, Colorado, letters are awarded with the school initials "TV", and in the school colors--black and gold. Explore Colorado, A Naturalist's Handbook, The Denver Museum of Natural History and Westcliff Publishers, 1995, ISBN 1-56579-124-X for an excellent guide to the ecological regions of Colorado. The Archeology of Colorado, Revised Edition, E. Steve Cassells, Johnson Books, Boulder, Colorado, 1997, trade paperback, ISBN 1-55566-193-9. The Tie That Binds, Kent Haruf, 1984, hardcover, ISBN 0030719798, a fictional account of farming in Colorado.